Reigning Philippine Ladies Masters winner Saranporn Langkulgasettrin sets out for another major crown here as she joins the hunt in the ICTSI Champion Tour at Malarayat, which gets going tomorrow at the Mt. Malarayat composite course in Lipa City, Batangas. Langkulgasettrin missed last week’s ICTSI Champion Tour at Splendido ruled by compatriot Kanphanitnan Muangkhumsakul but 17-year-old rising star from Phuket is all primed up for this week’s $75,000 event, ready to take the cudgels for the big 25-player Thai contingent against a crack international field, led by the country’s top players. Muangkhumsakul has begged off to honor a previous commitment to play in China but with Langkulgasettrin as spearhead, together with former ICTSI Ladies Philippine Golf Tour champion Wannasiri Sirisampant, the Thais are upbeat of their chances to sweep the first two legs of this year’s ICTSI Ladies Philippine Golf Tour which also serve as part of the Taiwan LPGA. 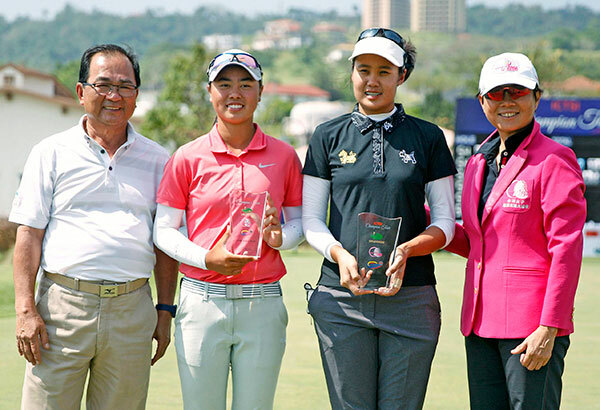 Langkulgasettrin beat Korean Lee Jeong-hwa by three to win the inaugural Phl Ladies Masters at Alabang Golf Club last December but the former Thai LPGA Tour winner expects a tougher challenge this time, especially from the bunch of local aces out to redeem themselves from their failed bid last week. They include rookie pro Pauline del Rosario, who finished joint second at Splendido, and Symetra Tour-bound Mia Piccio, Cyna Rodriguez, Princess Superal and Dottie Ardina. Meanwhile, Langkulgasettrin, Sirisampant and Taiwanese Chen Min-jou, Pan Yen-ling and Hsin Lee join the Pinay shotmakers in today’s pro-am tournament with officials and guests of the event’s chief backers, including ICTSI, BDO, Champion, Custom Clubmakers, Empire Golf and Sports Shop, KZG, Sharp, Summit Mineral Water, Titleist and Event Captain.